The eighth season of the American comedy-drama television series Scrubs premiered on ABC on January 6, 2009 and concluded on May 6, 2009 and consists of 19 episodes. The eighth season was the first to be shown on ABC after NBC dropped the series, ending its seven-year run on the network. ABC’s pick-up of the show was followed by it commissioning nineteen episodes, which included an hour-long finale. For all of the season’s run, it was expected that the eighth season would be the last, especially after the show’s creator Bill Lawrence announced it. After rumors surfaced of a ninth season, it was understood that the eighth would be the last to star Zach Braff and much of the main cast. However, the show was later re-commissioned for another season, in which Braff and other cast members appeared for multiple episodes. The eighth season was the first to air in high definition. Needing to cut costs for the eighth season, Bill Lawrence stated that he divided the writing staff up into two groups, half for the first nine episodes and half for the second nine episodes. Additionally, each main cast member was absent for three episodes during the season. 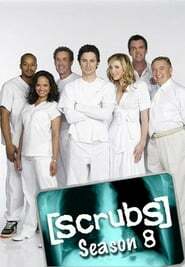 An accompanying web series that aired on ABC’s website called Scrubs: Interns was also created to coincide with the season, starring the new interns with guest appearances by the main cast.